I am just coming off a fantastic trip to Chicago for NRA 2012. I need to debrief! So many great people doing so many great things. It’s amazing! My head was spinning by the time I hit the pillow last night! 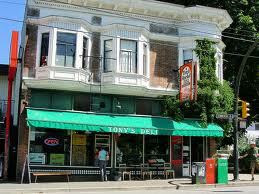 I entered the food business 15 years ago focused on fixing a distressed deli in Vancouver. At the time, I was just looking for a good business opportunity to get into, but I had very few resources. I had a young baby and my family was growing. I really just had to make a living! My decision to purchase the deli came without much thought. It just felt right to me. So, as I have always done in business, I followed my intuition. It has always served me well. There is no way that I could have predicted the outcome of that project. What I know today, is that by focusing on what I thought was the right thing, the Deli became my food business laboratory. On Monday night, May 7 2012 in Chicago, more than 300 friends, colleagues, prospects, customers and suppliers came to Bennigan’s to gather for conversation. Conversation not just about the restaurant industry, but in many cases, to share personal stories. Many new connections and friendships were forged on Monday. It made for a fantastic evening. So much happened at NRA for me this year, but what stands out most in my mind is the smiles and the optimism that surfaced in the room at Bennigan’s. It reminded me again that our industry is full of kind and generous people who work hard every single day to serve our customers. The food industry is amazing. It is huge! There is so much opportunity for those who persevere, as long as they are authentically adding value somewhere in the chain. In order to have a positive business experience, you have to add value along the way. If you do that, through effort, sweat and persistence, luck is the dividend. But it takes time. I learned that from reading about Ray Kroc. He was so, so smart. 1. Below is a photo of Jim Vinz, Co-CEO LeDuff America, kindly accepting a check for $5000 to Share Our Strength from the up to date net proceeds from the sales of my book. It was an important moment for me, on a personal level. I am driving to raise $100,000 through these proceeds, but that will only happen if the book adds value. I am told by those who have read it, that it is worthwhile. 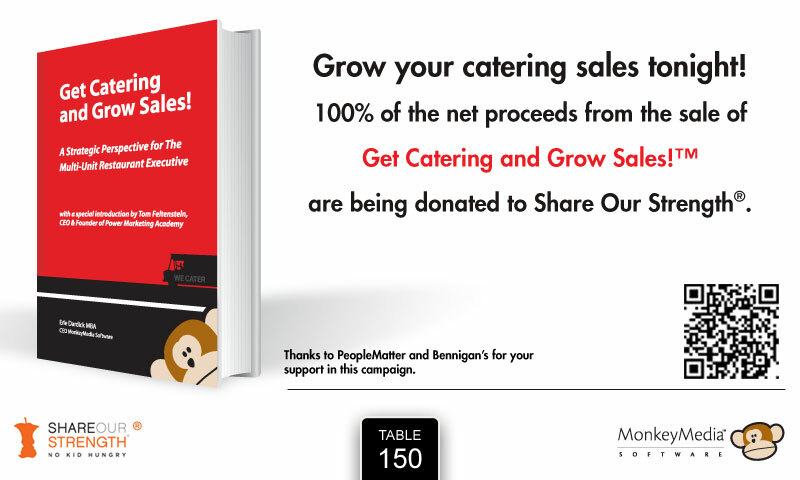 If you are serious about catering and growing your off premise restaurant sales, purchase the book for your team members or if you are a supplier, buy copies for your customers. The proceeds go to a great cause and towards improving the lives of many people. 2. Below is a video that we shared that night. When this video was played, the whole room stopped and it was the only moment in the evening where everyone was focused on a single transformative idea. That was really great to see! I was trying to think of something more important to write about today, but I realized that what happened that night WAS important. Why? Because that room, (and I am certain hundreds like it at other NRA gatherings), was full of amazing people all doing their part to make a difference in a complex world. For me, it was a night of learning. I find the human spirit fascinating! People are powerful when they unite. Let’s get together soon. Oh… before I go, let me put up this quick graphic for ordering the book. Just scan the QR code with your phone and you can order copies of Get Catering and Grow Sales! if you think it might be time well spent for you. All Net Proceeds go to Share Our Strength. Outstanding evening topped off with such a generous donation from the Monkey Media team…and special thanks to Bennigan’s for the delicious food! Thanks for your kind words Charles! Thank you so much for making time. It was great to see you. I had the fortune to be at this gathering. It was fantastic. Great energy and fun in the room. Thanks Juan! It was fantastic to see you there. Fanatastic video Erle. I can hear your words coming out of this adorable kid, (He’s very smart). Sorry I missed the Chicago event, I know it was great. It was a great night Jay! Chad says hello! Sorry you couldn’t be in Chicago. See you soon. “Boom wake up!” Now that’s a call to ACTION…….. – I love it. Wow if kids ran the restaurant next door we’d have some formidable competition! My biggest regret having to leave Chicago was missing the event with Monkey Media and People Matter – two great companies with heart & smarts! The video is adorable – and also very smart. Thank you so much for all of the work you are doing to support Share Our Strength and #nokidhungry. We will end childhood hunger! Thanks for your kind words Joni. We received orders for 500 books the last few days which represents another $7000 or so for SOS! I am really happy. Perhaps we can chat more about this. See you soon. What a fun evening at Bennigan’s. Enjoyed the time and conversation and loved the video. 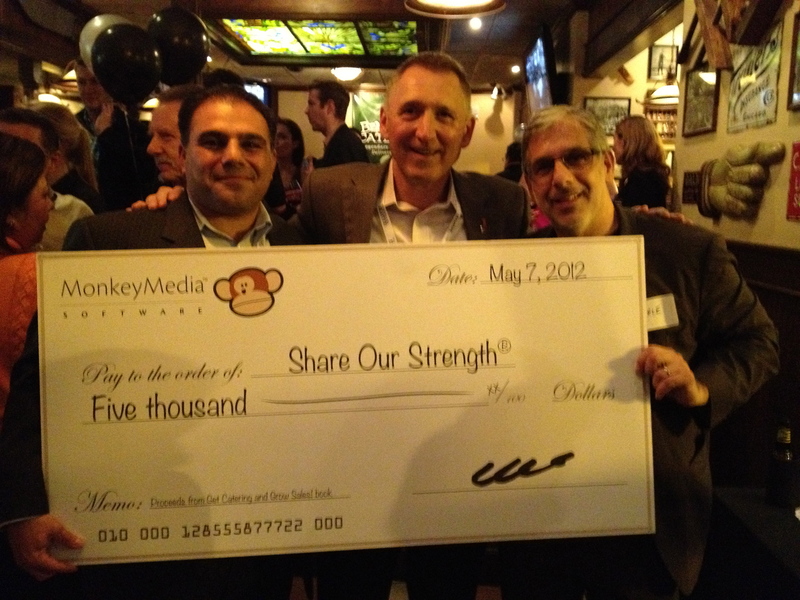 Special thanks to Monkey Media & PeopleMatter for including us. Thank you for your kind words Jennifer! We are glad you could make it.